I have just returned from a gastronomic expedition to Italy's capital of food, Bologna. Not only do I have a diary of wonderful places to eat fine food, but memories of small family run restaurants, frequented by locals, that serve-up delicious and rustic home cooking using fresh local ingredients. The aptly named La Rustica is one such place. Tucked away in the University quarter of Bologna, on Via San Vitale, you might blink and miss this little osteria with its small wooden tables, paper table clothes and napkins and compact menu pinned to the door. If you don't. then you are in for a treat. Mama and papa occupy the kitchen with their off spring out-front and while the welcome might be a little reserved, the waitress soon broke into a smile when I tried out my Italian. While you wait for your drinks to arrive, locals queue for take-away pizzas or stand at the tiny bar sharing a glass of wine with papa, while his wife prepares the insalata. I visited La Rustica on two evenings in five days and before 7.30 pm there was little difficulty in getting a table, but by 9.00 pm, Bologna's regulars and it's 'temporary' University clientele had seized most of the covers. A look later on the well known TripAdvisor website, revealed that I was not a lone tourists in visiting on more than one occasion in a week. Full of gratified customers and glowing comments, La Rustica is clearly a hidden gem in Bologna's chest of sparkling restaurants! And the food? I hear you say. As you might expect, the pasta is glorious and cooked in delicious mouthwatering sauces with fresh tomatoes, basil and other ingredients. I tried the Tagliatelle in a Tomato Sauce With Meatballs on my first visit and the pasta was firm and the meatballs soft and tender - a mix of beef and pork, making them a light accompaniment to the lush sauce that coated the delightful tagliatelle. My main dish on night two was Ricotta Tortellini in a Walnut and Gorgonzola Sauce - a dish to die for! Smooth pasta with a fresh cheese filling covered in a cream sauce that had been beautifully blended with the gorgonzola, contrasting with the firm addition of walnuts. The sauce hung together beautifully, and I scraped every last morsel off the plate, only to turn to some bread to ensure my plate was beautifully clean and shiny when the waitress appeared. I could have eaten it again - not because of the quantity, but because of the quality! 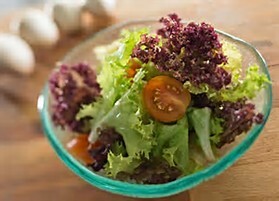 As for starters - don' miss the freshly prepared insalata mista (mixed salad). Thankfully no carrot, a common addition in Italy, just a range of lettuce, fresh baby tomatoes and rucola, ready to dribble with a delightful local olive oil. Other choices include mozzarella and tomato with basil and there's a home-made soup, of course. La Rustica has a range of local wines by the bottle, but why venture any further than a carafe of their vino della casa (house wine)? Yes, its young and so it's sparkling, but it's a great accompaniment to their delightful home-made food and it's good value at 7 euros for a litre if you are on a tight budget. 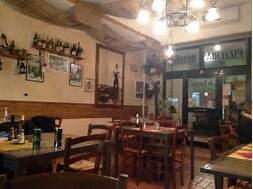 But for any tourist to Bologna watching their euros, La Rustica is an ideal place for good value delicious local food. A two course meal for two persons with wine and water and a gelato for me to finish-off my meal came in at only 39 euros! Try beating that in Italy's capital of food?